When filmmaker Dawn Porter was approached to produce and direct a new documentary about Robert F. Kennedy and his 1968 presidential campaign, she thought back to an interview she had done for her first feature documentary, Gideon's Army, with former Attorney General Eric Holder in his office at the Department of Justice. Holder was seated at Kennedy's old desk that he used when he was attorney general; above the desk was a portrait of Kennedy. Holder told Porter that, as a boy growing up in Queens, he was captivated by seeing the Kennedy brothers on television and was drawn to the idea of a life in public service. Porter also remembered that her own grandmother had a picture of the Kennedy brothers hanging in her dining room. "I kept thinking, 'Bobby Kennedy is so important to Black people. What is this?! Why is there this love for the Kennedys in the Black community?'" With her love of history and background in law and political science, Porter seemed like a natural fit to the German producers who originally approached her to produce and direct what was then intended to be a feature-length documentary focusing on Sirhan Sirhan, the man convicted of Kennedy's assassination. Later, Porter combined forces with prominent producer Laura Michalchyshyn, who felt that the project would work better as a series examining Kennedy's life and work. With just a sample reel of some characters and a concept, the two pitched the project to Netflix, which eagerly supported their vision and agreed to produce the film as a four-part series. While any documentary about the Kennedys walks a well-trodden path, Porter's vision brings fresh perspective in several key ways: by taking advantage of a trove of archival material that had lain dormant for decades (including little-seen footage and outtakes from DA Pennebaker); by examining Kennedy from the perspective of key civil rights leaders and others who knew and worked side by side with him, rather than family members or scholars; and, perhaps, most interestingly, by taking a close look at the trial of Sirhan Sirhan and the questionable legal representation that he received. 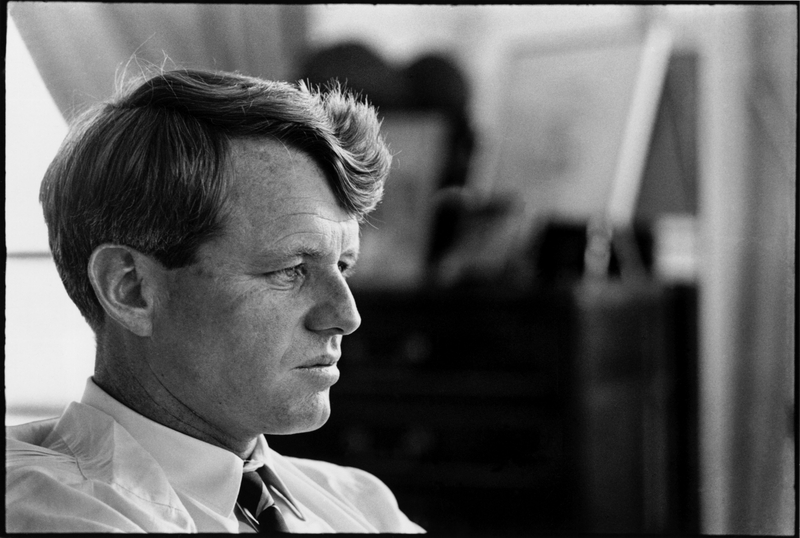 The four-hour documentary Bobby Kennedy for President premieres Friday, April 27, on Netflix. Did you ever feel like four hours was a lot of time to cover Bobby Kennedy's abbreviated presidential campaign? Dawn Porter: No, I felt like it wasn't enough. I felt like you have a responsibility to give enough time to something that's historical. That was hard. What's enough time to service this story, but not so much that it bores the audience or gets bogged down in too many details? Ultimately, what I felt like the driving central question should be is not so much the historical events in and of themselves, but what do they tell us about Bobby Kennedy's evolution as a politician and a person? Why was the sincerity of Kennedy's political views surprising to you? Like many people, I have a healthy skepticism about politicians. We always want them to be sincere, but sometimes you just can't help feeling that they're telling me what I want to hear. Watching hundreds of hours of Kennedy's speeches and home movies and all this different footage, he said the same thing to different audiences. He said the same thing to rural White voters in Oregon that he said to White businessmen in Mississippi and to students who were challenging him, and to African-Americans. I was just struck by that. The other thing I was struck by is the people who worked with him, and I very intentionally picked, with one exception, people who worked with him or knew him in that kind of way. Marian Wright Edelman was working with him. Peter Edelman worked for him. I wanted to choose people who were not going to be third-party people describing history, but people who were there. All of them would talk about not just his sincerity, but that he drew on these core beliefs in deciding what policies to pursue and what actions to take. What I didn't want was to have historians commenting and looking back. My first goal was, Could we do this like LA 92? Was there enough footage to just tell this story without any commenting folks? And that didn't quite work out for this story. Yes, we tried really hard, sometimes to the exasperation of people working with me. So then I was like, Well, the next best thing is people who were there, and to let them describe their experiences and emotions. I wanted firsthand witnesses, but I wanted those witnesses to amplify and deepen your experience of the footage you were seeing, so that the footage comes first. When I do a vérité film, my goal is to help you understand as much as possible what this remarkable person is experiencing or doing, and let you judge for yourself. I don't like to be so heavy-handed that you know what you're supposed to think. And I was hoping that by being able to experience so much archive, you could begin to really feel like you know this person. By the end of it, it's like he's alive. You are experiencing the sadness of his death because you saw how effective he was in life. Why did you decide not to interview any family members or critics? Among those interviews included in the film, Neil Gallagher [a Democratic Congressman from New Jersey] is definitely a critic. He dresses it up in nice language, but he's definitely a critic. I didn't want to have critics for critics' sake, but looking back, I probably should've broken my own rule and included some critical historians because to be honest, if there's a weakness, it's that there weren't some more critical voices. The last thing I want people to think is that this is a commercial for Bobby Kennedy as a perfect person. I don't think that. I hope it doesn't come across that way. You're always second-guessing yourself and looking back and seeing what you could've done better. The family I felt differently about. I don't think Ethel Kennedy would've done an interview. Had she done it, she would've been the one person I wanted. Knowing that, I talked to Rory Kennedy at the very beginning of the project, and in talking to her, I felt very acutely the fact that this was their father and husband. As much as they share him with the world, the pain of his death is still quite acute. To be perfectly honest, my father died when I was 12, and I related quite viscerally—particularly to Rory, but to all the family members—in thinking what would I really be asking of them, and I decided early on that I didn't want to put them through that. I feel like that would be really excruciating. I know that would've been excruciating for me as a person who lost my father as a child. Talk about working with all the archival footage and what stood out to you. That was a huge undertaking. Rich Remsberg is the archivist, and he is as critical to the film and to building this out as any member of our team. Elizabeth Wolff was the producer, and Elizabeth is one of those people who never met a fact she doesn't love, so she read every single book, watched all of the films and watched all 240 hours of archive. Together, she and Rich would write us a scene brief with all the archive that we have. So, we had an outline of all these really important moments. Only after we exhausted the effort of what archives serve these moments did we then go to interviews to fill in. Tell us a bit more about the Sirhan Sirhan story. In some ways, the Sirhan story was how the project began. I'm sure the German producers came to me because I'm a lawyer and because I had done Gideon's Army, and the producers and the legal team thought correctly that that would be interesting to me. I'm not a conspiracy theory person, but I was curious about Sirhan's trial, and then, with a little digging, we found a lot of information that I felt hadn't been discussed because there are so many conspiracy theories about the assassination. When you look at what the trial was like, it wasn't very good. As a lawyer, as a person who's interested in the justice system, I found that really interesting. If Bobby Kennedy's accused killer can't get a good trial, who can? We hired Lauren Capps, who's a great investigative reporter, and I said to her, "I don't want to be romantic about this. You go kick the tires and you dig into this." We have the whole trial transcript, and she started there and then she read all the books. Lauren would go try and find documents to support or refute what had been written in other books. She really treated it like an investigative reporter would. Then she created this 30-page report, and that's how we approached that episode. Coming out of that, what we felt comfortable saying was, I can't tell you if there was another person in that room where Kennedy was shot. I can tell you Sirhan did not have a trial that explored that question. And because of that, that allowed a lot of people to theorize about what happened. And that is not good enough for a trial that was that important. It's not good enough for the accused, and it's not good enough for the country. It raised again how tragically ironic it was that in the case of Bobby Kennedy, whose main mission was to have a solid justice system, even his accused killer was not served well by the justice system. The film seems to be asking, Unless there's justice for Sirhan, can there be justice for Bobby? I think that's right. And I think one of the reasons why I love documentary film is you have time to bring people along so that they can understand that. If I just said, We can't have justice for Bobby Kennedy if we don't have justice for Sirhan, you don't understand that unless you understand all that came before and what that trial was like. Sometimes you need a lot of time to explore and excavate those questions. And I felt like by doing this as a series, we got enough time to do that. What I hope that this series adds is an invitation to explore that question: Can there be justice for Bobby Kennedy without justice for Sirhan, and what does that also mean for having a just society? Can we say we live in a just society when our criminal justice system doesn't give justice to the least powerful among us? What would be the one thing you'd most like audiences to take away from these four hours? I'd like people to recognize that there are indeed great leaders, that there are some people who understand and make use of their natural abilities for the good of other people. And I find that comforting in our very turbulent political time, when we tend to fairly distrust that there's this idea of leadership. I also feel like Bobby Kennedy made race relations and repairing them and improving them a central part of his political ideology. Today, where we have people who run from that, it says to me, If in 1968 he could do that, we can do that now. And I'd like to give America the benefit of the doubt. There is so much discussion about the White disaffected Trump voter. If Kennedy could talk to those people about racism and race relations and why it's good for the country, then so can we. How did Dawn Porter put her stamp on this story? I felt like I put my stamp on the story by giving you the Blackest Bobby Kennedy you'll have. Your narrators are Harry Belafonte, John Lewis, Dolores Huerta, Juan Romero. They're taking us through that time. Bobby Kennedy didn't inspire Harry Belafonte but, when they came together, the sum of their activity was greater than each of them. I think that's the same with John Lewis and Dolores Huerta. I felt by giving their voices some primacy, that was one of the ways that as a filmmaker, as a Black woman, I could say, Wow, look at how fascinating are these interactions. And this is really how change happens. It’s this process of engaging with people who have different experiences than your own. That's how change happens, and that's something I learned in the process of making this film. Ken Jacobson, a contributing editor at Documentary magazine, is VR and documentary programmer at the Minneapolis St. Paul International Film Festival and VR curator and Forum programmer at AFI DOCS Film Festival.